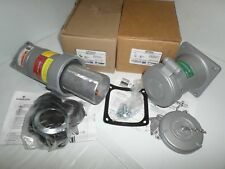 **NEW IN BOX** APPLETON 150 AMP 3W 4P SET ADR15034 & ACP15034CD BOTH PCS. Leviton 2711 Locking Plug. New in box surplus. Punch Flange Tools. Nail Guns & Nails. Tap & Die Sets. Auto Maintenance & Care. Extension Cords. Electrical, Wiring & Testers. Air Riveters. Air Saws & Blades. Leviton plugs and connectors are designed to withstand impact, corrosion and chemicals. Residential grade plastic devices resist grease oils and acids. Hubbell CS8365L CS8364L 50A 250V 3Ø 4 Wire Twist Lock plug Connector _ LOT 0F 4. DO YOU NEED MORE PLUGS???. NEMA Number: 6-30P 6-50P. We would highly appreciate the chance to follow up with you if needed. Dielectric strength: OVER 100M MIN at 500V DC. NEMA Number: L14-20P. Make sure it will fit before you buy. Color: AS the picture. Main material: PA6, Nickel plated brass. Style: Angle Plug. Main Color: Black. Item Weight: 150g. This was removed from a new Kubota generator for a custom build. It has never been used. 6FT heavy-duty power cord allows you to keep the power strip in an unobtrusive location while making sure it reaches your devices. ● Cord Length: 6ft power cord. Surge Protector. Power Strip. Type :6FT 6 Outlet 3 USB Power Strip. Ideal for assembly of a custom length cord set. These cULus Certified devices have the features required by electricians for performance and safety. Not all wiring devices are equal, look for UL Certification and features that provide value. 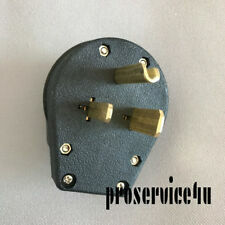 1 PCS 50 amp 220 Volt 3 prong plug. US Regulatory Standard :50A 220V industrial 3 prong plug. Model :10-50P. You will receive exactly what you see on the picture. Condition: 100% new and high quality. Type: Receptacle. NEMA: L14-30R. Style: Twist Lock. Electrical Female Plug. Locking Male Plug. Great for connecting to a generator with a 120/240 volt outlet. 1 x Electrical Female Plug. 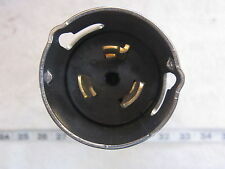 1 x Locking Male Plug. Heavy duty external cord grip to help prevent cord "Pull-Out". Ribbed nylon back body stands up to abuse and provides ease of grip. Authorized Marinco Dealer, Warranty & Free Shipping!! Rated 125VAC/15A; female plug also available. WARNING: Proposition 65 requires California to publish a list of chemicals known to cause cancer, birth defects or other reproductive harm. In August 2016, OEHHA adopted new regulations, effective on August 30, 2018, which change the information required in Proposition 65 warnings. Approved:UL& CUL E257757 SGS. Body Material:PA6 ,H62,PC. Insulation Resistance:AC 2000V 1. at 500V DC. 15amp - 125volt. 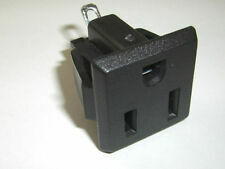 3 prong outlet plug (male & female end plug). 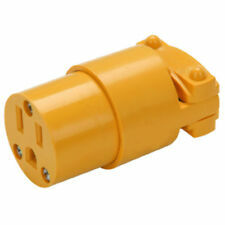 Replace worn or broken plugs to bring new life back to power tools, appliances & extension cords. 10 Pc - Female plugs. 10 Pc - Male plugs. New High Quality Cooper RV & Generator NEMA 10-30P 125/250V, Dryer Power Plug L10-30P. TEMCo ID: CP0009. About TEMCo Industrial. Rated Amperage: 30A. NEMA Electrical Plugs. NEMA ID: L14-30R. Certifications: UL Listed. Connection: Female. Heavy-duty rubber cover with galvanized steel clamp to keep cord secure, wires from pulling out. Rated 125VAC/15A; female plug also available. Replace worn or broken plugs to bring new life back to power tools, appliances & extension cords. 30A 125V/250V. Great for connecting to a generator with a 120/240 volt outlet. Auto Display Parts & Accessory. Auto Display Parts. Airless Paint Spray. Brake Caliper. 4-Padded FR Envelope 10-RegionalBox A. Great for connecting to a generator with a 120/240 volt outlet. We would highly appreciate the chance to follow up with you if needed. Main material?PA6, Nickel plated brass. 10 New Hubbell HBL5266C 15A 125V PBG Edison Male Plugs. New High Quality L15-30 Plug - NEMA L15-30P Locking Plug, Rated for 30A, 250V UL. Specifications: 30A, 250V UL. NEMA Number: L15-30P. Model # YGA022. NEMA: 6-20P. Volts: 250V. Replace worn or broken plugs to bring new life to power tools, machines & extension cords. Type: Plug. Style: Straight. Allows connection of machine to 115/120-volt or 230/240-volt receptacles without tools-just choose the plug that fits the receptacle. Need a new plug?. This UL listed device features Easily accessible grounding screw. GE monogram on face for easy identification as Specification Grade. Minimum plate opening for this device is 1.57". MANUFACTURED IN THE UNITED STATES. 15 Leviton 16352-A almond Decora Plus duplex receptacles. Each is individually boxed. Features include Type: Decora Receptacle. Amperage: 20A. Color: Almond. Quantity in Lot: 15. (SKU # L16352-A-15PK; Weight: 3.3 lbs.). It is aNEMA 5-15P to NEMA L5-20R. 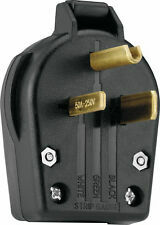 The NEMA 5-15P is a 15 Amp, 125 Volt household straight blade male plug. The NEMA L5-20R is a 20 Amp, 125 Volt locking female connector. NEMA 5-15P to NEMA L5-20R. Cooper Wiring Devices 1257 flush mount receptacle. 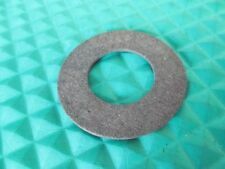 If you have an older dryer with a non-grounding plug (that is, a 3-blade plug), check out ourNEMA 10-30 outlets. Features include Part Number: 1257. Lot of 10X New AC 110V 15ANon-Grounding Light Duty Power Plugs. Solid copper poles. This is a L1420P locking male plug. These are High visibility yellow with Eagle's exclusive kwiklok cord clamp system. L1420P plug will plug into a L1420R receptacle or a L1420C female connector. The L1420R receptacle is among the most common receptacles in portable generators, making this the most common plug to fit many portable generators made by Generac, Coleman, Honda, Yamaha Briggs and Stratton. Part Number: 515PR. Item model number: 515PR. Beveled edge prevents snagging when dragged. Use with 18 3 to 12 3 cable. 2 pole, 3 wire. 15A/125V, NEMA 5 15. UL listed. Use with model. TEMCo ID: CP0010. About TEMCo Industrial. Rated Amperage: 30A. NEMA Electrical Plugs. NEMA ID: L14-30P. Body Type: Inlet. Certifications: UL Listed. Connection: Male. NEMA 5-15P to NEMA 5-20R. This adapter is perfect for work around the house. With this adapter, you will be able to use those products anywhere around the house! NEMA 5-15P, 15 Amp, 125 Volt Male Plug. Generally use 12 gauge or heavier, and a double pole breaker of no more than 20A behind the outlet serving this plug. 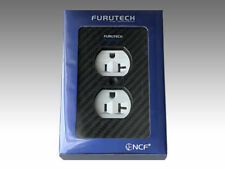 If GFCI protection is desired, use a 2 pole GFCI breaker with a neutral sense lug. Miller MVP Plug for power cable 5-15P (115/120 V, 15 Amp. Allows connection of machine to 115/120-volt or 230/240-volt receptacles without tools-just choose the plug that fits the receptacle. Need a new plug?. ). Leviton 4716-FWP locking flanged inlet with integrated wallplate and weather-resistant cover. Suitable for indoor and outdoor use. 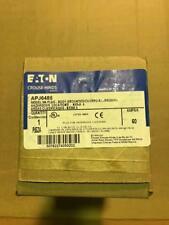 Industrial Grade, NEMA 5-15P, 2-pole, 3-wire, grounding, rated 15A 125V. Type: Receptacle. NEMA: L14-30R. Replace worn or broken receptacles to bring new life to power tools, machines & extension cords. ▲ Type: Receptacle. ▲ Volts: 125/250V ▲ NEMA: L14-30R. ▲ Style: Twist Lock.